Hot Mobile is the Lava Reef Zone boss for Sonic and Tails. Knuckles skips this boss and moves straight on to Hidden Palace Zone, but can play this level from the Level Select using Debug Mode. When reaching the end of the Zone, Knuckles will knock a large boulder at our heroes, sending them down to a lava crater and knocking them out of their Super or Hyper States. They land on a few platforms over the volcano, where Dr Eggman is waiting for them. He will fire four sets of paired rockets while the screen auto scrolls to the left. It's advised if you can use your Super or Hyper transformation, that you don't do it now because you will need delicate movements to transverse your way through the autoscrolling madness of a set of regular platforms targeted by the missiles and a set of collapsing platforms thereafter. Eventually you will reach a checkpoint followed by a lavafall. Four descending platforms await your (forced by the autoscroll) leaps across. On the fourth platform the autoscroll stops, allowing you to jump down to get a Lightning Shield. Use it to jump left to find a Fire Shield. Ride another one of the small platforms down to the boss. Dr. Eggman will emerge from the lava in his Hot Mobile and cause the lava to tilt, making the platforms you're standing on ride into his mobile shattering them. 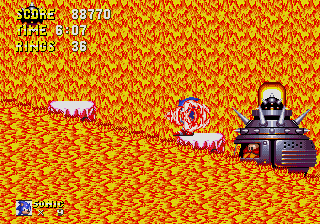 This machine can't be hurt by Sonic or Tails directly, but the doctor will fire mines in the lava in the gaps between the platforms, three times a round. Your job is to jump from platform to platform while avoiding the mines while they hit Eggman instead. After this the machine will descend back into the lava and he will change sides and repeat his attacks again. This boss battle is made much easier if you can walk on the lava with your Super State or Fire Shield. After 14 self-inflicted hits, Eggman is defeated. This boss takes place on its own level, which is listed in the Level Select as "Lava Reef Zone Act 3". However, the player keeps the time, rings and shield from Act 2, to make people understand that is part of said act. Due to keeping the rings from the previous act, if the player has 100 or more rings held, grabbing one of the three rings at the start of the boss level automatically grants him/her an extra life. If the player has instead 200 or more, grabbing two of the rings gives him/her two extra lives. This is a clear evidence of the Boss level being a completely different level rather than Lava Reef's Act 2, as it is impossible to get two extra lives in a level if the player has already reached the 100-ring and 200-ring marks.